Had a great time this weekend at the super*Market comic book show! Got to see a lot of friends and meet a lot of cool people! Ted Seko and Javier Hernandez had piles of their work for sale. My table was right next to awesome painter, cartoonist and storyboard artist Pete Von Sholly. During the slow parts I got the chance to chat with him and look at his eye-poppingly beautiful paintings! I'm glad I got to see Louie Del Carmen...I haven't seen him since he went over to Dreamworks. ---and Dan Goodsell's table was right across from me! He's the co-author of one of my favorite books: "Krazy Kids' Food," the curator of The Imaginary World's Ray Patin Exhibit and the creator of Mr. Toast. And a really nice guy! That's me muggin' for the camera. Thanks to Jessica Gao for taking this photo and for putting on a really fun show! Also (not pictured)... had a chance to catch up with Erik Wiese and Jessica Chaffin from The Mighty B, Stuart Ng, Sean Kreiner, and Anson Jew. I got to meet Jerry Beck and Scott Shaw, and of course I got to meet a lot of rabid comics fans! See you at the next one! This frenetic five-pager from 1948 was hidden in the back of issue #14 of ACG Comics "The Kilroys," which is otherwise just a run-of-the-mill teen comedy Archie-wanna-be. I gotta thank Eddie Trigueros for turning me on to this book. He was even nice enough to let me scan it, but like a doofus, I lost all the scans when I was resizing the images in Photoshop. There's no explanation for Harry the Hoople-Snake. He is what he is. It's a cartoon! What great crowds! Every face is hideously different. A real horror show for our hero. As usual, Count Screwloose escapes back IN to the Balmycrest Booby-Hatch where life is not so crazy! The WHOLE five-page story is available to click on and download below. Wow! The crowd LOVES it! Just CLICK on each of the images below and a nice BIG comic book scan page will open in a new window. Enjoy! Just CLICK on each of the images below and a nice BIG comic book scan page will open in a new window. A few months ago I posted a fantastic seven-page Count Screwloose comedy epic from ACG's Kilroys #5. 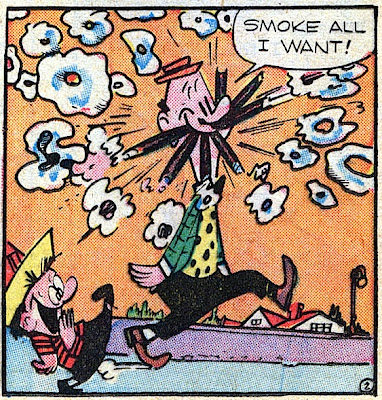 Just CLICK below on the goofy dude smoking a mouthfull of cigars to jump over and see that delicious set of vintage comic book scans! And the Asifa-Hollywood Animation Archive has some super scans of Milt Gross newspaper comics like Count Screwloose and Dave's delicatessen HERE. super*MARKET - THE ANIMATOR SHOW! Come by and say, "Hi"
MELTDOWN COMICS AND COLLECTIBLES IN HOLLYWOOD. I'm gonna be hanging out at the super*MARKET show at Meltdown on Sunday (March 30). A whole bunch of cartoonists from the LA animation scene will be there too, showing and selling all the comics we make when we're not working on a show. 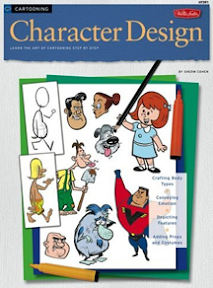 I'll be there signing copies of my Character Design book, as well as selling some original art from the SpongeBob comics that I've drawn over the last few years for Nickelodeon Magazine. If you're in the Los Angeles area, I hope you'll stop by and say hello! For more info, CLICK on the super*MARKET picture above, or CLICK HERE. See you there! Jim Tyer Heckle and Jeckle Comics - FUNNY Stuff! by the great Jim Tyer! from the pages of a Mighty Mouse comic book. that will open up nice big full pages so you can read the whole thing! As if knife-wielding cartoon Indians weren't enough...ALIENS! This whole comic feels like total stream-of-consciousness stupidity. Here's the whole six-page story! FULL PAGE image will open in a new window!